What Model Do You Want Your Brand On? Rebranding is available for a variety of Models. Check out a quick video demonstration that shows just how easy it is to apply your branding. Unlike other manufacturers, we don’t require customers to place orders at large quantities in order to take advantage of our service. We will take your logo and apply to the bezel. The only cost will be the phone(s) and the bezel(s). see pricing below. For Distributors, Resellers, ITSPers', having your own LOGO can keep away from vicious price competition and get reasonable margin. The pricing of the bezels is as follows. Just looking for a single sample? For a limited time you can purchase a single phone and get the bezel and branding for FREE! 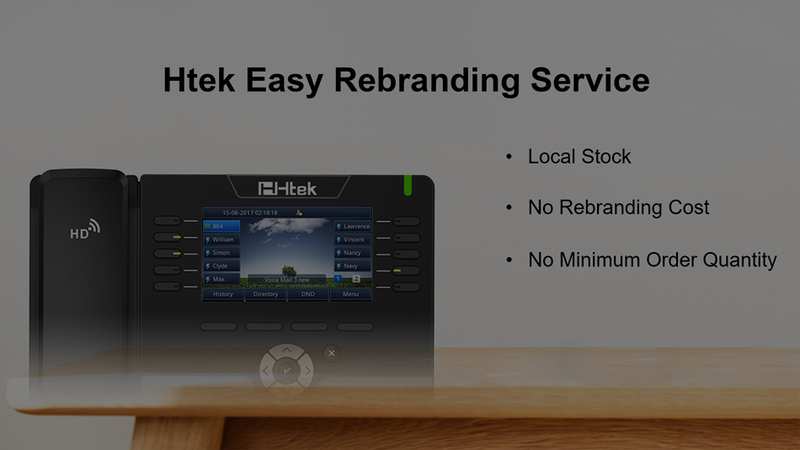 Below are some assets to help you get started with Htek Easy Rebranding. Call us at +86 25 84658050 or fill out the form below to get started. sales@htek.com Copyright © Nanjing Hanlong Technology Co., Ltd. 2005-2018 All rights reserved.